A friend of this blog writer had the crazy idea few years ago to go to the Running of the Bulls festival in Pamplona for his stag weekend. Truth told, none of the rest of us were too keen on the idea – and his bride-to-be didn’t like it either. We ended up in Edinburgh instead. This takes place each June on the feast day of St. Willibrord, the Patron Saint of Luxembourg. It’s like a parade, except people don’t march along. They hop along instead. Nobody quite knows why the tradition started, but it dates back over 1,000 years and the people of Echternach have no intention of halting the tradition anytime soon. Incidentally, St. Willibrord – originally from England – trained and was ordained in County Carlow, before going to Luxembourg in 690AD to found a monastery there. He is depicted in a stained glass window in Carlow Cathedral. This is held in March, so you’ve already missed it for this year, but it’s worth remembering for the future if you enjoy a grand spectacle – and a good fire to warm yourself by! Hundreds of grand papier mâché sculptures of mythical figures are paraded through the streets each day for a week, amid all sorts of partying and celebration, before the sculptures are all set on fire in a blazing finale. Don’t get too close! There must be something in the water around Valencia, because the small town of Bunol, just 40km away, hosts a crazy festival each August. 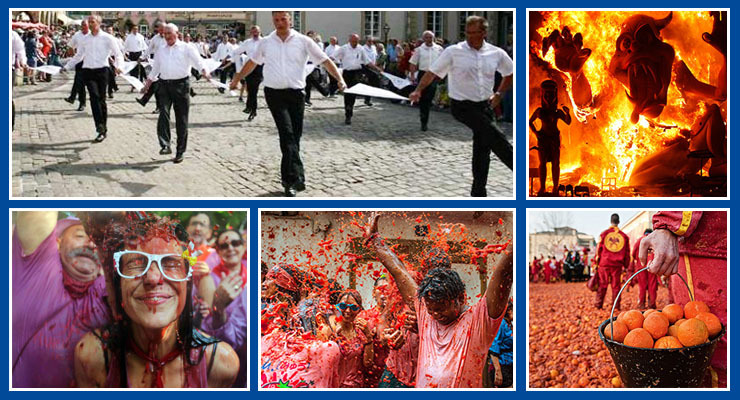 It’s La Tomatina, and it’s dedicated to the tomato, which is the staple crop grown in the area. It’s not like County Wexford’s Strawberry Fair though, with people sitting around enjoying eating them. Instead, they throw tonnes of them at each other, and at everything else that moves. Literally tonnes. It’s Europe’s biggest food fight. Bring a change of clothes if you go near this one! Here’s another one in Spain, this time in the town of Hara, in the La Rioja region in the northwest of the country. It’s held each year between June 28 and 30. As the words ‘La Rioja’ and ‘Vino’ suggest, this one features wine, specifically the red wine the area is famous for. But like La Tomatina, it doesn’t involve consuming it. It involves thousands of people throwing it at each other and shooting it via all manner of water pistols and the like. Again, bring a change of clothes. And when trying to clean the ones you wore to the festival – remember that old tip about how white wine can remove red wine stains! Moving away from Spain, but not moving away from food fighting! This festival in Ivrea in Italy, near Turin, is held each year around Shrove Tuesday. It sees colourful costumes galore as citizens re-enact a medieval battle that freed the city folk from a ruling tyrant. And yes, you guessed it – oranges are thrown as weapons. The oranges are said to represent the testicles of the tyrant, as it seems his were removed and flung into his face while he suffered a particularly grisly death. Ouch. If thinking of taking in any of these festivals during your travels, we hope the worst that happens to you is a sore leg from too much hopping in Echternach, or some stained clothes from getting in the way of stray tomatoes, wine, or oranges. But remember that unfortunately, things sometimes do go wrong on holiday – and that’s why it’s so important to take out travel insurance before you go. The peace of mind and back-up support it can provide in the event of things going wrong can make all the difference between still being able to enjoy your time away from home, or it being a complete disaster.